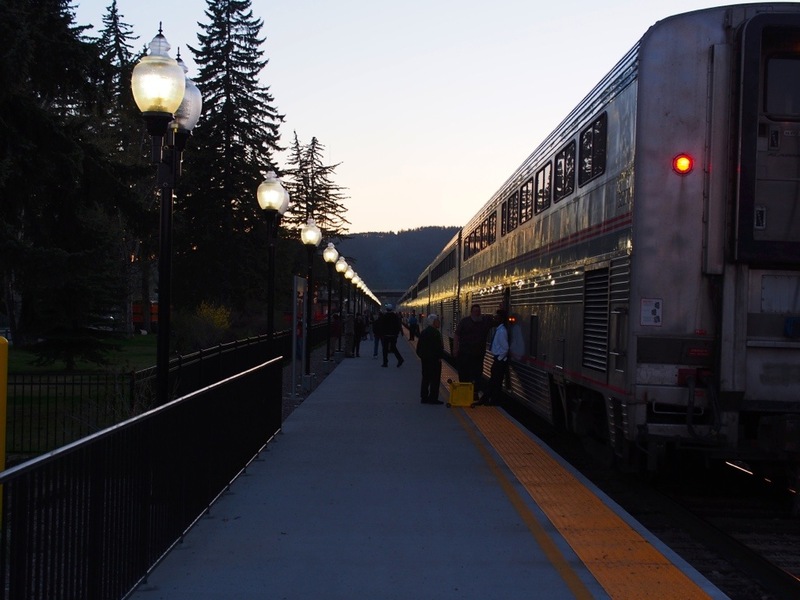 The Empire Builder is Amtrak’s most popular cross-country route. It crosses 8 states and takes two full days. I have been wanting to ride it ever since my first train trip last year. We met a group from Texas who raved about the scenery and the wildlife. I immediately put it on my bucket list. My sister Karen and I boarded in Chicago – you can see more of our tour of Union Station in Chicago here. Traveling by train is a totally different experience. Boarding is low stress. 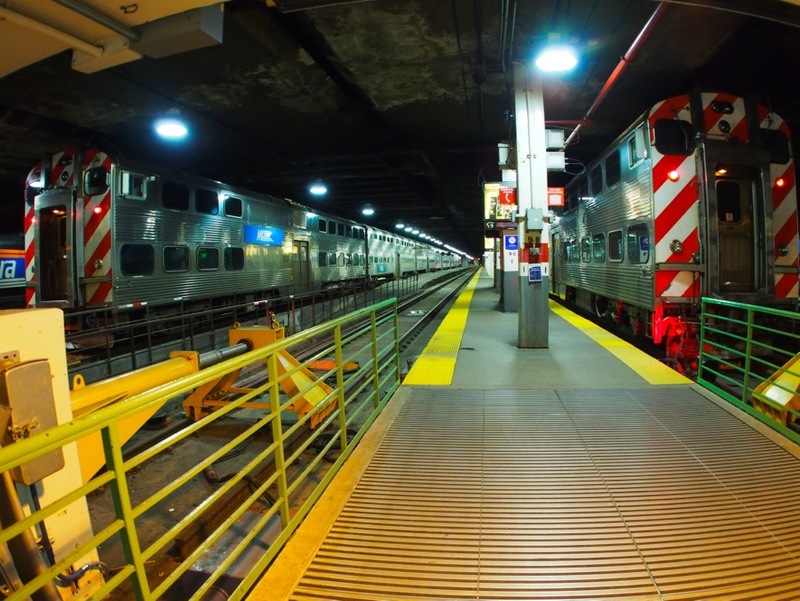 In Chicago they have a lounge for sleeping car passengers, so you can drop your bags and do a bit of sightseeing before you board. You show up 30 minutes early and the conductor scans your ticket in the lounge. You walk out onto the platform and a car attendant helps you settle in. No long lines, no TSA, no stress. This is not our train, the diagonal stripes indicate it’s a regional or commuter train. With two large suitcases in tow I just couldn’t get a shot of ours. The boarding process is quick – maybe 15 minutes total – and your adventure begins. This is Charles – the consummate host. he was our Car Attendant, but before the journey was over he would become a friend. Our first trip featured a Car Attendant, Pete – who was thorough but detached. He carefully managed all the rules for us and always had a thick notepad in hand. He was helpful, but not personal. Charles was nothing like Pete. He had filled an empty sleeper birth with snacks, magazines, blankets, and even chilled champagne. A frequent traveler on this line saw Charles and begged him to get his berth changed to ride in his car – he assured us we had lucked out. Charles was a single dad from Jamaica. he was raised in Detroit and had recently moved home to help care for his mother. 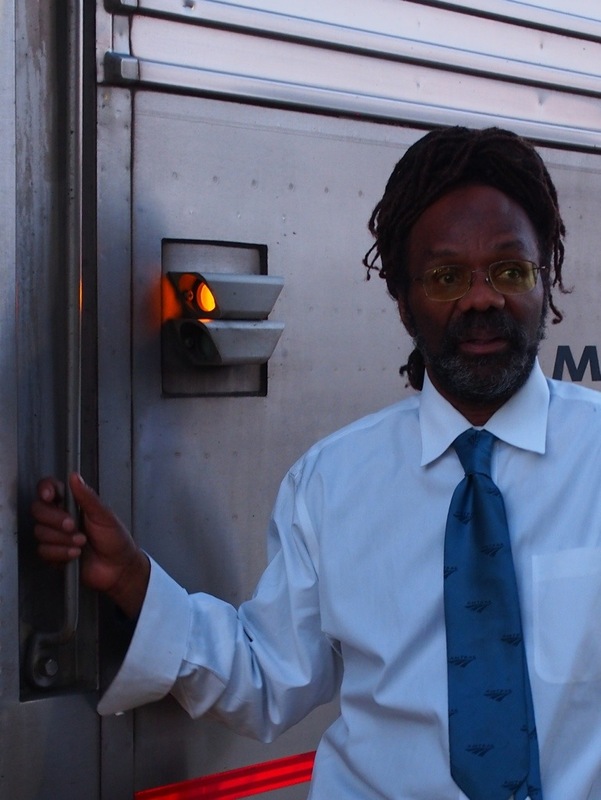 He had been with Amtrak for over 40 years – he knew everything about the kitchens, the car births, the stops – he clearly loved train travel and his enthusiasm made our trip even more special. As we settled into out Roomette we watched the grit of Chicago fade into the distance. Every 2-4 hours during the daylight the train stops for 10 minutes for a “smoke break”. 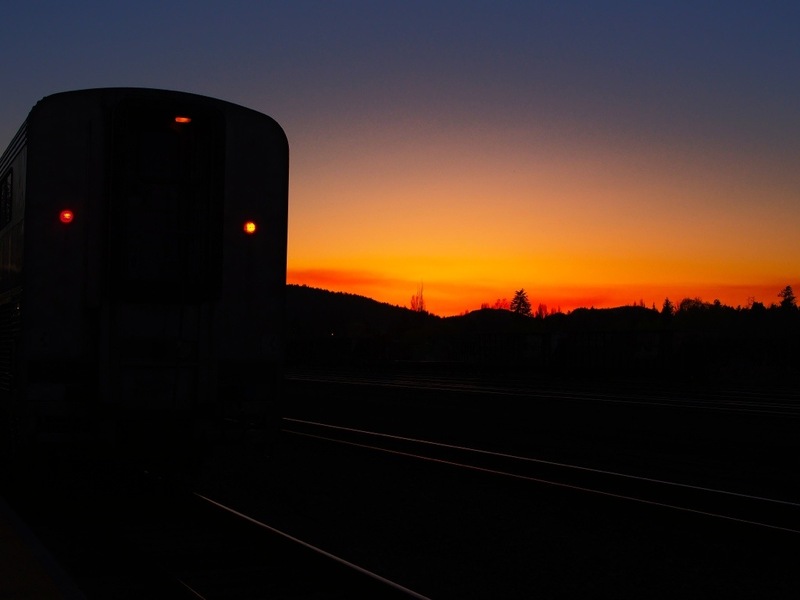 The Empire Builder only makes a single service stop, and that is late at night when passengers are sleeping. 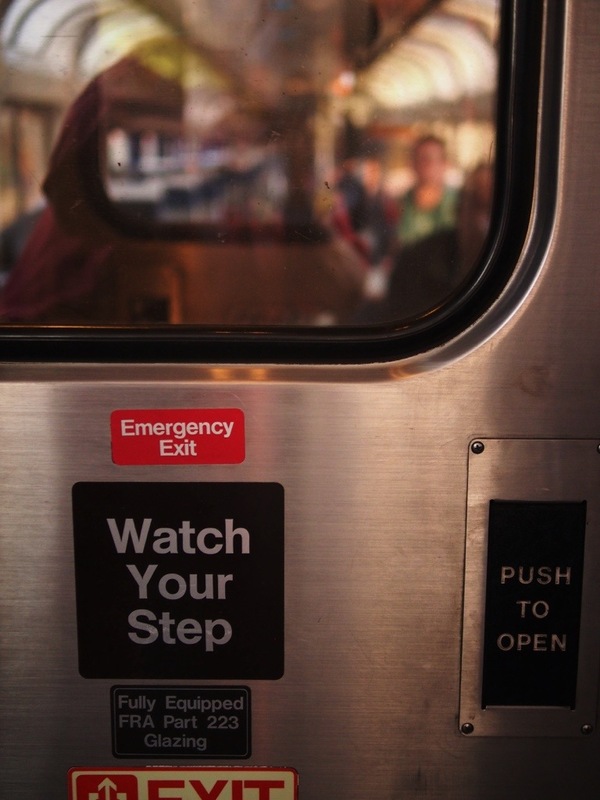 There is no time along the route to get off and go into a station, there is also no warning that the train is leaving. You stay close so that you can see your Car Attendant shepherding his charges back aboard. Karen and I collect railroad nails that are scattered along the tracks. We tried to get some in each state. This was Milwaukee – Charles noticed this and made sure that we had nails from every stop, even if we were asleep. Eventually we had so many that we secretly dumped the extras somewhere in western Montana when Charles was otherwise occupied. 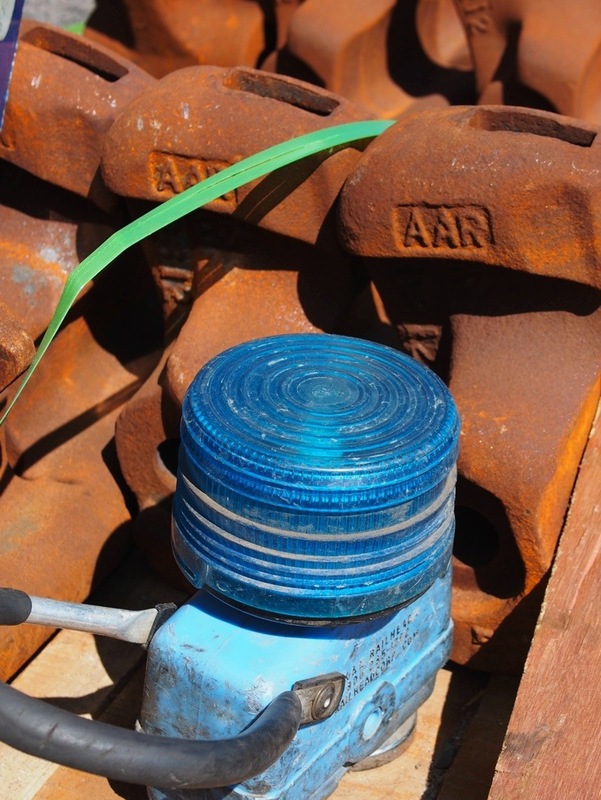 Even in the Milwaukee switchyard opportunities for macro shots arise. 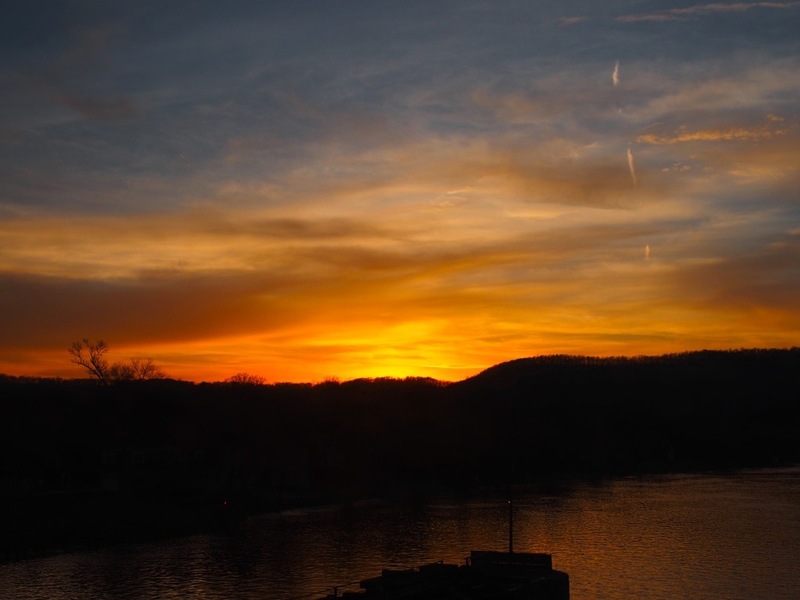 Our first evening started with steaks in the dining car and ended with this sunset as we crossed the mighty Mississippi. We followed the river for the next 450 miles. Charles popped in to tell us that he had made up a larger room for us, since the larger cars were empty on this trip, he set us up in a large sleeping car with a larger bed and our own bathroom. Actually, he allowed us to leave out things in the Roomette – essentially we had two rooms at this point, one on each side of the train. 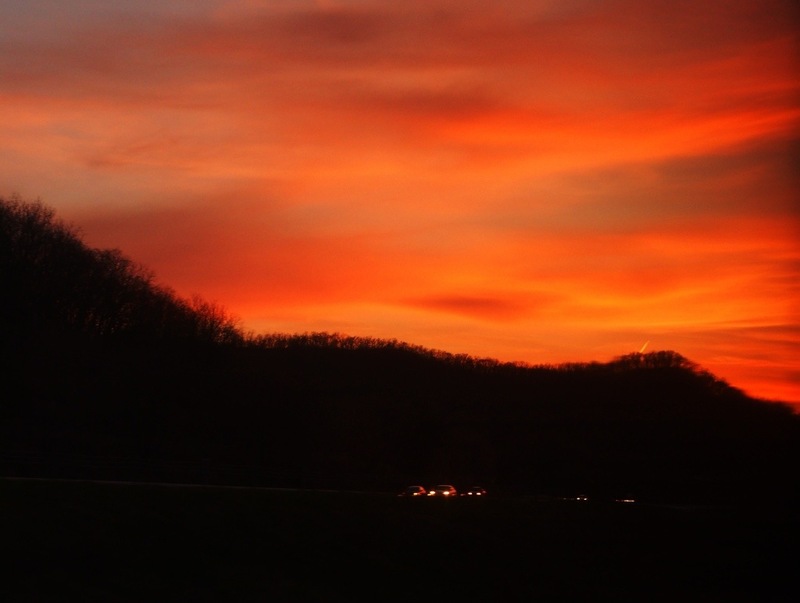 This shot was the last light as we crossed into Minnesota. Karen took the top bunk. I slept on the couch that converted into a bed. Since the window was on my level I spotted the first light somewhere west of Fargo, North Dakota. I took several shots as the sun reappeared, but even though this one has no focus I loved the color and light. Karen refers to the windows as movies. We awoke to watch a movie called North Dakota. 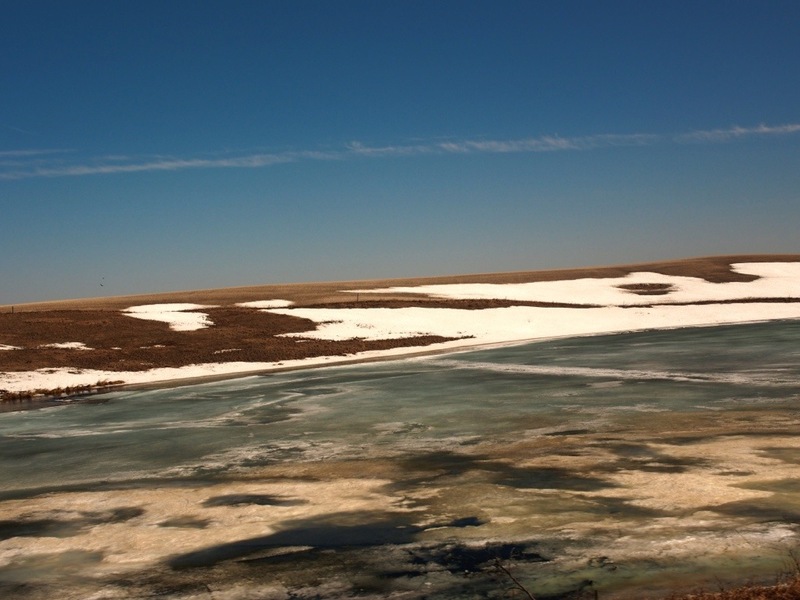 Not exactly an action film, but the melting snow and ponds will stick in my memory as a picture of the state for me. After breakfast we took up residence in the Observation Car – the “movie” screens are larger in here. Karen and I started the day trying to figure out how to shoot throughout the windows and get as few reflections as possible. These doors were a constant sight for us. We were in the last car on the train. 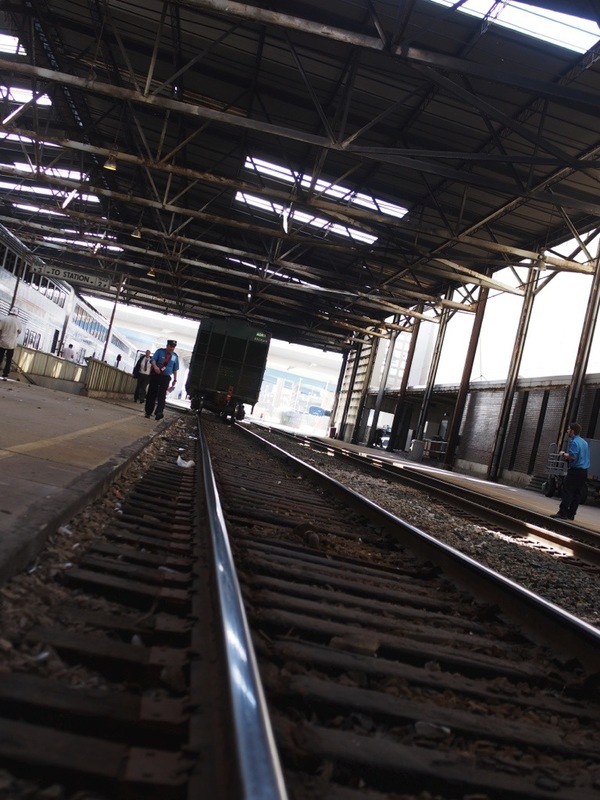 The Empire Builder terminates in two cities – Seattle and Portland. The train is set up so that the front half contains the Seattle coach and sleeper passengers as well as the dining car. The back half contains the observation car and the coach and sleeper cars bound for Portland. In Spokane the train is split and a new engine added to the back half. Having the observation car and a cold breakfast was definitely the better option since we railed in along the amazing Columbia Gorge. Being in the very last car also allowed us to look out the back window from time to time. This was taken during a smoke break in Eastern Montana. In remote stops the stations are simple small buildings and the grounds are filled with parts that could be needed for repairs on this long journey. 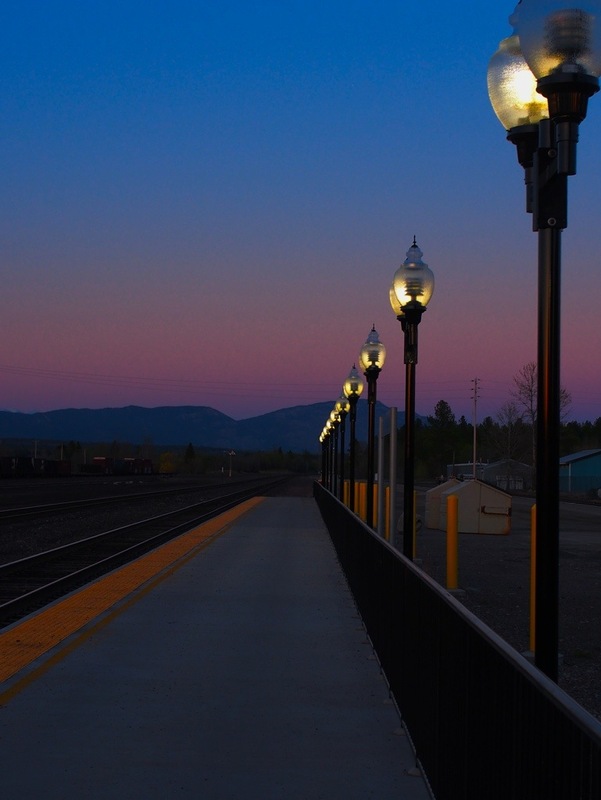 So many of the passengers on the Empire Builder are traveling from city to city along the route – it’s economical and easy to get from Fargo to Haver, Montana. The Builder is a lifeline between these small cities, and we met many passengers who use it frequently. Of course, it’s hard to photograph a train you are on, especially knowing that you could be left behind if you didn’t make it back on in time, so I would occasionally shoot trains in the station – this is a Burlington Northern engine. 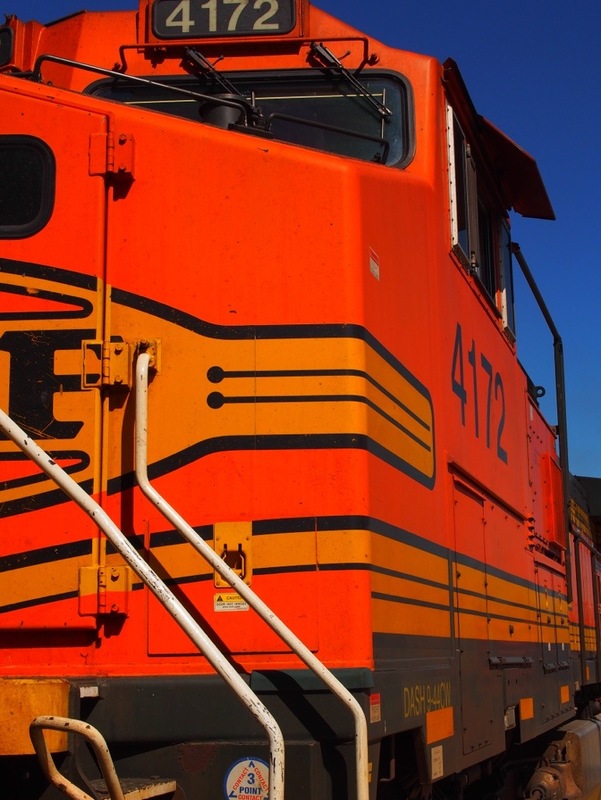 I’m partial to Union Pacific trains, but that orange on the open plains was pretty eye-catching. Day 2 in the Observation Car was amazing. Karen gets her gear in order. Today we will cross the Rockies, Glacier National Park, and the Continental Divide. The “movie” for today – Montana! There was a good sized group of Amish travelers on the Builder. I spoke with one of the younger men at the snack bar below deck – he was so excited to see the Rockies for the first time. 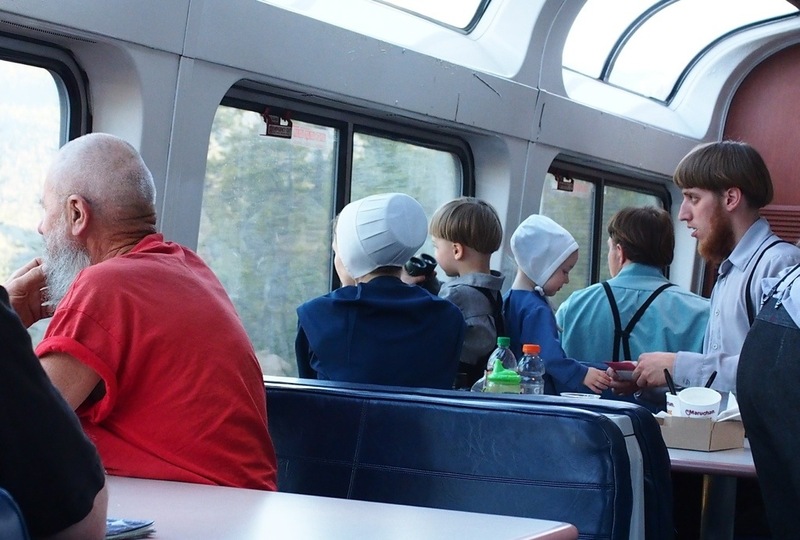 They brought their own food and spent lots of time with us in the Observation Car. At one point a young man from their group connected with a hipster who had been sitting across from them staring. He urged the hipster to come sit down and they had a nice long talk. At first the hipster spoke down to the young Amish man – assuming he had little knowledge of the world – their conversation ended with one of the most eloquent and thoughtful presentations of the Gospel I have ever heard. Both men left respecting each other. On a train there is time to connect like that. A park Ranger boarded right before we entered Glacier National Park – he even brought a Parks Passport Stamp with him – score! The sun was very bright and created glare on the windows, so good shots were not easy to come by. I have read the weather has to be a perfect match of sun and clouds with no fog to get really great images. This one was my best. Sometimes the image just needs to live in your mind, and on this trip so many did. We saw more elk and deer than we could count towards sunset. Waterfalls, mountains, lakes, stunning beauty lay at every turn. At the stop before the park 4 passengers assumed the train would wait while they went inside the station to buy souvenirs, they were wrong. They would get to experience Glacier tomorrow with strangers as they headed towards a reunion with their families. There was a grumpy man in our sleeping car whose wife was one of the four. He blamed Amtrak, Charles, and everyone except himself or his wife. By the time we left the park she had been located and put up for the night. They were traveling without a cell phone (crazy) and Amtrak managed to get messages back and forth to them at each station. Honestly, I believe that woman probably had a more peaceful trip the next day. As the crowds thinned after we left the park this young girl remained looking for someone to play cards with. She travels on the Builder a couple of times a month with her grandmother who cannot make her way between cars. She has the run of the train. When this gentleman tried to teach her a card game she paid no attention to the rules and floated off after a few minutes to lite in another booth, a butterfly that catches your attention for just a moment and moves on. She is growing up on the Builder. Our last smoke stop on day two was unusually long. Amtrak officials were getting word to loved ones about the missing 4 and we got to spend sometime looking for Montana nails as the sun began to set. Sunset over our sleeper car. Sometimes you can get exceptional color by shooting the sky in the opposite direction of the sunset. All in all this last stop was perfectly timed. In the morning we would awaken on a shorter train moving along the Columbia Gorge. The Builder follows the route that Lewis and Clark took towards the sea – what this land must have looked like to them – majestic, wild, diverse – seeing it a couple hundred years later it still has the power to inspire. I had mentioned to Charles that the next day would be Karen’s birthday. He had been talking to her about birds, Karen has a business caring for exotic birds, and he came to call her the “bird whisperer”. I had imagined candles on a muffin or something to start off her birthday. Charles outdid himself – in the morning he delivered a sweet card, a blown glass bird (does he pack this stuff in his luggage just in case? ), and a bottle of Washington wine – above and beyond! Portland Union Station – another jewel, but with bags in tow I chose to leave all but one of those images in my heart instead of my camera. 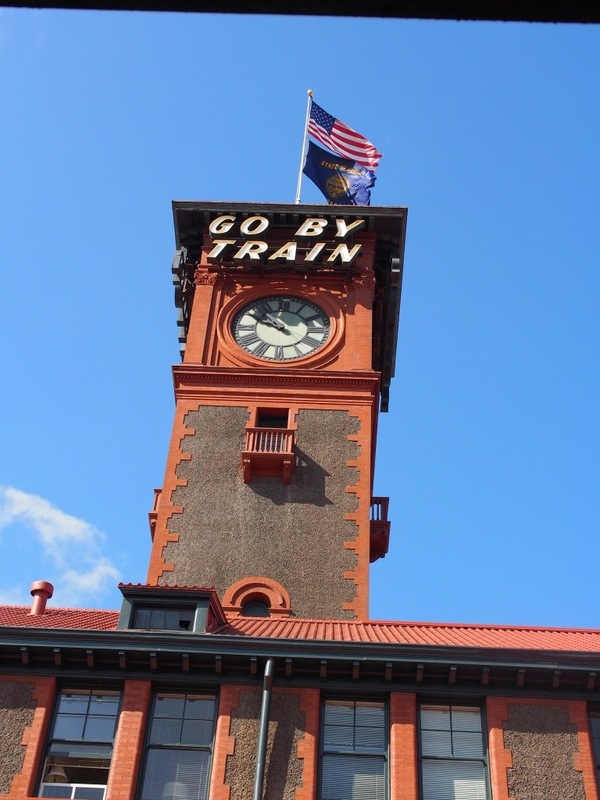 Go by Train, it really is the best way to see and experience America. This entry was posted in Photography, Trains, Travel and tagged Amtrak, Empire Builder, Glacier National Park, Lewis and Clark, Milwaukee, North Dakota, Olympus, Olympus E-M5, Portland, sleeping car by artsifrtsy. Bookmark the permalink. What an adventure you describe! 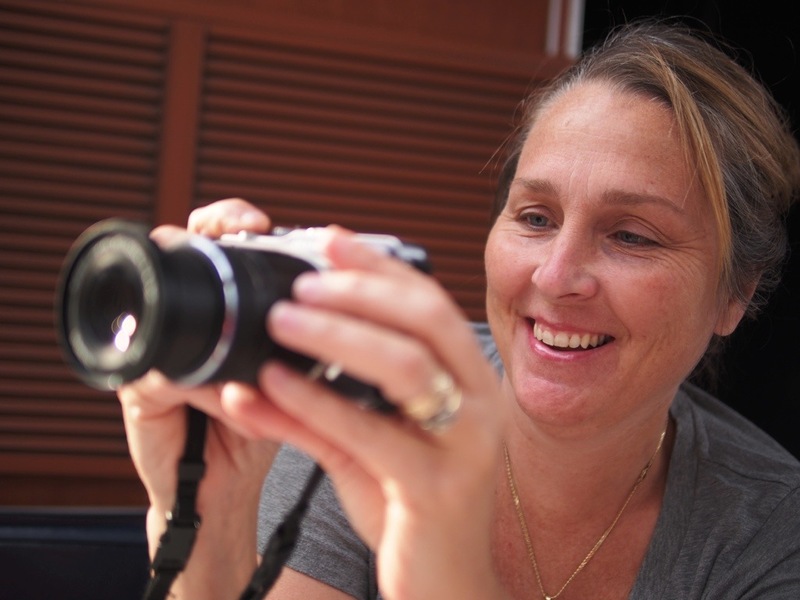 I think this is a fantastic addition to your blog to include in this post the details of your journey and stories of the people you met along with the brilliant photos. I travelled the states / Canada by greyhound bus 35 years ago and I can relate to how peaceful it is not having to do the driving and navigating – just sit back, relax and take in the scenery. The train seems better for socialising and sleeping though. It gives me the inspiration to add such a trip to my own wish-list. Thanks! WP has been a little twitchy the last couple of days. Good to hear from you. 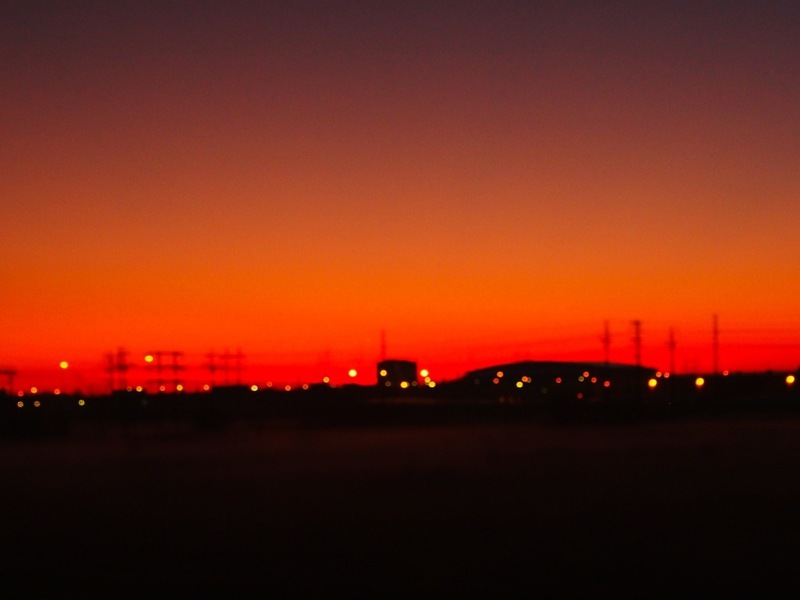 Fargo was in the middle of the night, but I remember Moorhead – that is some wide open country! I was surprised by how much snow and ice was still there. Thank you for taking me on the journey with you! Well thanks for coming along with me Russ! I have often wondered what train travel would be like. It sounds interesting but different. You don’t get the chance to get off and shoot very often, but the scenery can be amazing. Last year we went through the Rockies on the same tracks cut a hundred years ago – the pass was just wider than the train – it was amazing. This is a wonderfully illustrated story of your travels. 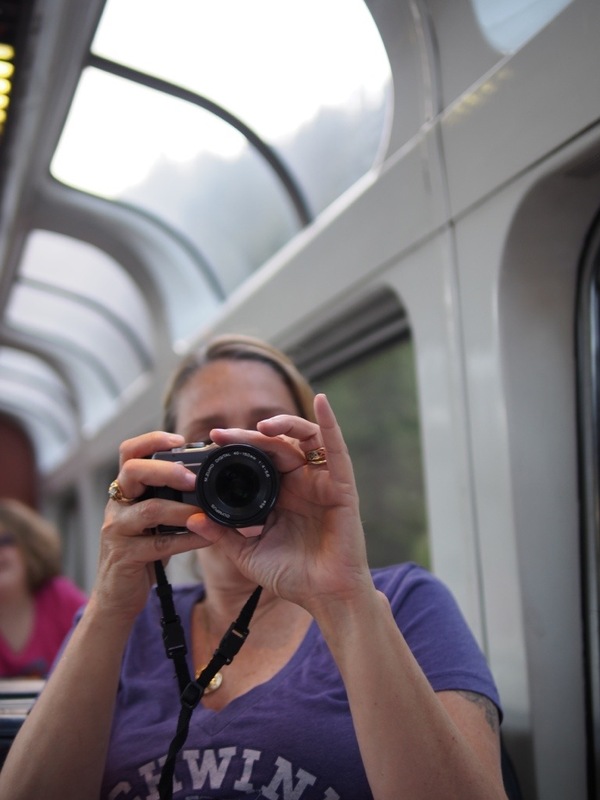 My wife and I love to travel by train and your trip has us thinking about a journey of our own in the future. 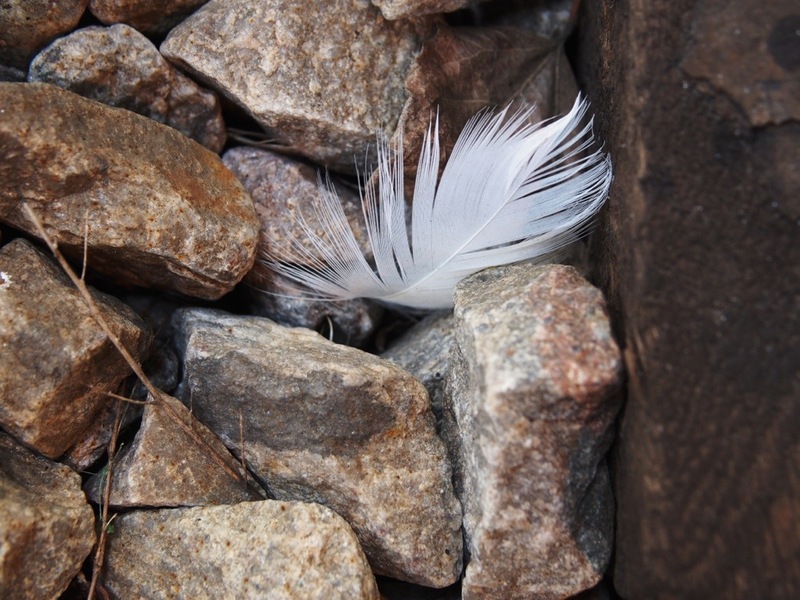 Thanks Allan, We went from Emoryville to Denver last year, the halfway point of the California Zephyr – it hooked us. I am already researching routes for the next adventure. We like to end up somewhere where there are lots of national parks to explore after the ride. Sounds like fun next year. A quick question: Did you try using a polarizing filter to shoot thru the windows? They cause a loss of a few fStops, but are a big help on a sunny day. You know, I did by accident – the shot of Glacier had a polarizer on it because I switched lenses and I forgot to take it off. That’s a great tip. I am glad to be of help. You have some really outstanding photos of this trip. I like the ones of the trains and trackside equipment. The train seems to be the way to go to fully enjoy a cross country trip and I agree, it is like a “movie” we just add the soundtrack. We did 2200 miles by train, followed by 1600 by car – the train was far more relaxing and took only 2 days compared to the 5 we spent on the road – although nothing beats really exploring places. This is a lovely share.. The wife and I want this year to do a trip from central South Africa all the way to the west cost of Namibia… this post has just made us both more determined to do it now… thank you.. I hope you do go – seeing Africa by train would be amazing indeed! The picture that is not focussed looks like a painting! If you were in Glacier National Park you were about 3 hours south of where I am! And!!! 20 minutes south of Waterton Park (Canada Side) I would love to do that train ride – can you catch it at Glacier National Park? I knew we were pretty far north at that point. Yes, there are stations east and west of the park. I met a couple from Seattle who rode to Browning and got and rented a car to explore Glacier and Roosevelt Parks and caught the train back 2 days later. Now that would be a neat trip idea! 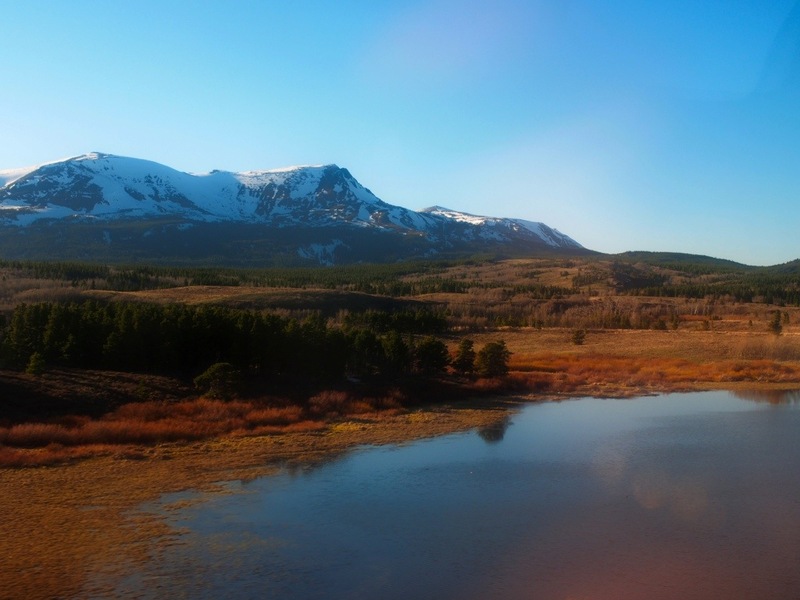 Drive to Glacier National and take the train to Chicago! That would be awesome, although the scenery from Glacier to Portland is amazing – Chicago is probably the cooler destination. A couple of years ago I wanted to travel by train from Alberta, to Wisconsin. I wasn’t able to because there are no trains anymore that go from here in western canada to the states, I would have had to travel by bus or car further east in canada then take a train. The cost was just too much, but it would have been a great adventure! In the states there are so many cities on the routes, you really can get just about anywhere. I have heard there is a Canadian route that runs about the same distance east and west that really nice too. Train Travel is the best. What an amazing adventure! I took the train from Rochester, NY to Norman, OK back in 2008. It was my first experience and a definite treat. The sleeping car experience is unique – at least it was for me. I love every minute of it and met some interesting people. 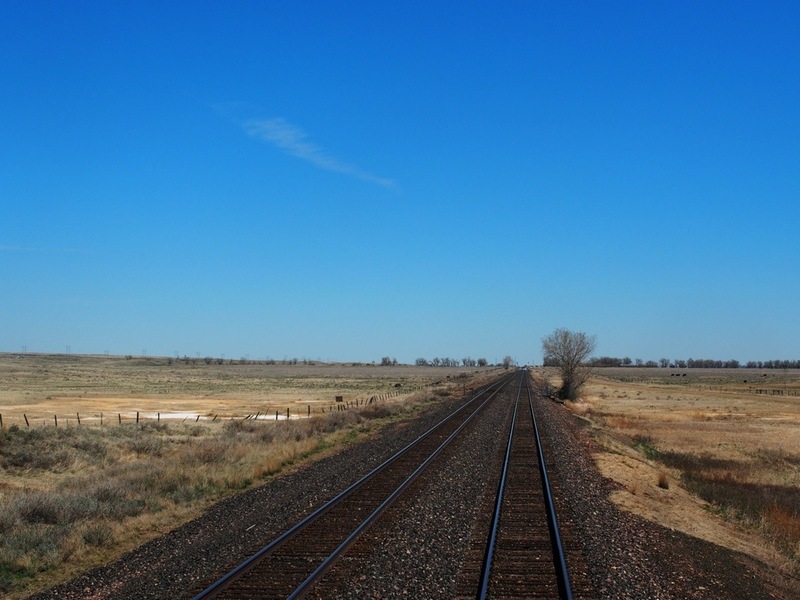 The scenery from Chicago to Texas wasn’t all that interesting (most of it was at night and just trees) but I would love to travel west from Chicago on the Empire Builder and see the sights! It was an amazing adventure. 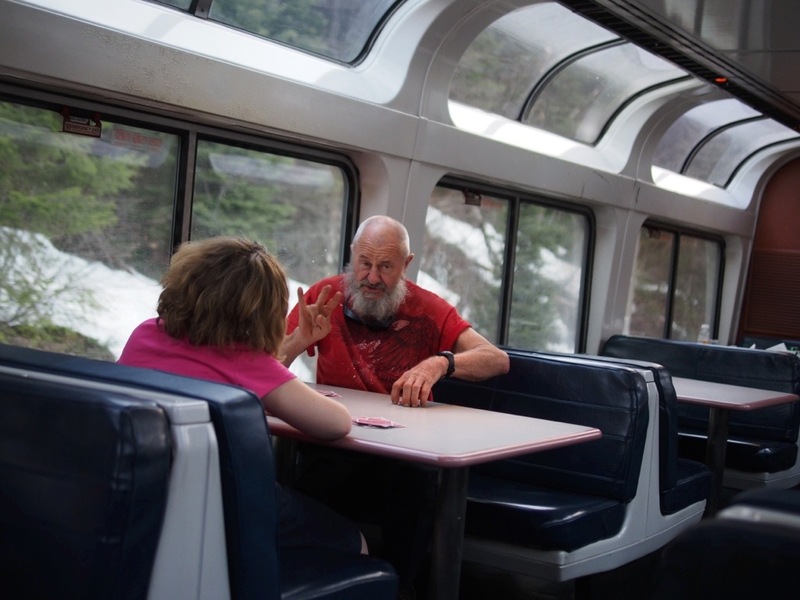 I met a couple from Seattle who took the train east to the stop on the east side of Glacier Park where they rented a car and spent two days in the part and caught the train back after their long weekend – I thought that was a marvelous idea. wonderful story & photos. You passed through my town (Moorhead, MN/Fargo, ND). The train is a great way to travel. We did go through there the first night. The train is the best way to see the country. At least it is to me.